BODY AFTER BABY - 3 under 3! The baby body journey is truly amazing isn’t it? Your body grows this amazing little human and once it has done its job growing gorgeous human it then helps you to bring gorgeous human earth side. Then what? You are left with a body that you no longer recognise. A jelly like tummy that resembles a sad deflated balloon, some angry stretchmarks and if you are really lucky some excess skin. Don’t get me wrong, the body of a mother is amazing and strong but Jesus Christ! That first moment you actually see your new body is a real eye opener. My first pregnancy was very easy. I literally breezed through it. I glowed, I worked all the way up to 38 weeks, I was active and so very proud of my tight little bump. Out came Harper, 7.5 pounds of gorgeousness and my body made it out reasonably unscathed. I had no stretch marks, hardly any weight gain and with a little bit of toning I felt like my old self. I showed right away. I felt bloated and uncomfortable. My morning sickness was worse, (cue random throw ups in the sink at work) and I certainly didn’t glow, not unless you count the glistening beads of sweat I would get from throwing up. I was trying to manage full time work, keeping up with a spirited toddler and be involved in life in general. But I was exhausted. Halfway through the pregnancy tests showed that I had an underactive thyroid. I was monitored but not put on any medication and at 30 weeks I finished up work, (falling asleep on your lunch break every day is not actually a good look apparently). I was finally able to rest, well as best I could while looking after a wild toddler, and enjoy the last few weeks of my pregnancy. Then came the stretchies. Those glorious tiger stripes made their very unwanted appearance at around 34 weeks. After making it all the way through my pregnancy with Harper and going 5 days over without getting one single mark, I was devastated. I was so self-conscious of my baby bump which was bigger this time around and my stretch marks hurt. My stomach felt like it was splitting in two. Tucker decided to stay inside for an extra 10 days, I literally felt my stomach double in size. Finally, at 9.8 pounds he made his entrance. Induced, no epidural, but I survived. After bouncing back so quickly with Harper I was struggling with this new body my sumo baby had helped create. I had angry stretch marks, excess skin and some weird eye infection that popped up right after Tucker was born. I felt disgusting. 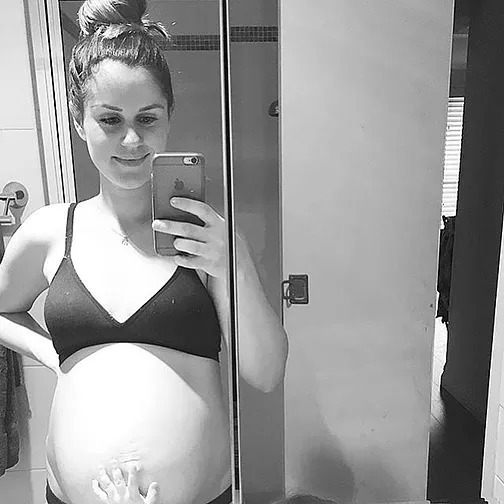 With support from my amazing husband and a lot of newborn love I slowly began to come to terms with my new body. I was proud of what it had achieved. The stretchmarks faded, the eye infection cleared up and I became focused on creating a strong body that could chase after my beautiful children. After a little while I started to feel different. Not in a good way. I was so lethargic. I had no energy and just wanted to sleep all the time. I could barely function. I would ring Aaron at work, crying, so confused why I felt so depressed. I had such a beautiful little family but I just felt wrong. What was wrong with me? Did I have Post Natal Depression? Was there something physically wrong with me? Then, Bam. Everything made sense. I was seven weeks pregnant. Tucker was three and a half months old. My head was spinning. How would my body cope? I just had a baby. I had just started to gain some control again. Straight away I was put on thyroid medication for my underactive thyroid. Even though I was so overwhelmed about the concept of having another baby so soon after Tucker I was relieved that there was a reason I felt so horrible. The first three months of this pregnancy were brutal. I was suffering severe morning sickness, trying to look after a teething toddler and a needy newborn. The thyroid medication took weeks to begin working and I couldn’t even get off the lounge without almost fainting. Everything was a blur and I couldn’t see the end. Fast forward a few months and things are much better. I’m 30 weeks pregnant, Harper finally has all her teeth and Tucker is getting more independent each day. It has taken me awhile to not feel guilty about falling pregnant so soon after having Tucker. I still can’t believe that in a few weeks I will be having baby number3! I now trust my body. My head is in a good place and I am no longer scared of stretch marks. I know my body will what it needs to in order to bring another healthy baby into the world. Sure, I miss my old body, this one has scars, wobbly bits and absolutely no muscle strength but this one will have carried and birthed three gorgeous babies. It is a body that has been through so much in the last few years but it’s the body that helped me become a mum and I am so proud of it.